Stephen Fry was educated at Queens’ College, Cambridge, where he was a member of Footlights. He wrote his first play Latin! or Tobacco and Boys in 1980. It won the Fringe First at the 1980 Edinburgh Festival. His writing partnership with Hugh Laurie began in 1981 and they produced Footlights revues for Mayweek, the Edinburgh Festival, and a three-month tour of Australia. They continued to perform together in various shows over a number of years. In 1984 he was asked to re-write Noel Gay’s musical Me and My Girl which made him a millionaire and earned him a nomination for a Tony Award in 1987. 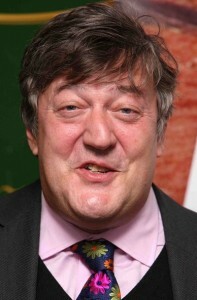 From the mid 1980s Stephen Fry began to be a familiar performer on British radio and television. He appeared to be witty and erudite, and not one to suffer bigots gladly. He also wrote for newspapers including a weekly column in the Daily Telegraph. He became a regular presenter of awards shows such as the 2001 and 2002 British Academy Awards (BAFTAS) and charity shows such as Hysteria for the Terrence Higgins Trust. Stephen Fry has made appearances on numerous television and radio panel games, chat shows, comedy series, and magazine programmes.